The protesters went on a rampage in the morning, barricading roads and burning tyres throughout the area. 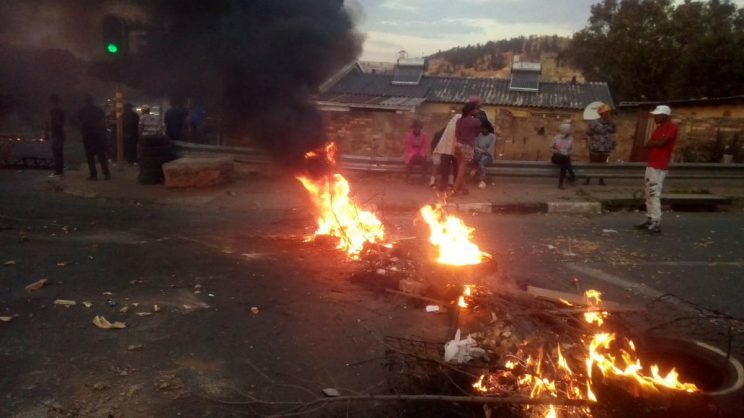 The Gauteng member of the executive council (MEC) for community safety, Sizakele Nkosi-Malobane has today condemned lawlessness during protest action by the Riverlea community and surrounding areas which has led to service delivery disruptions. “I am deeply disappointed in the manner in which community members conduct themselves every time there is a protest action. It is a constitutional right for members of our communities to organise themselves and engage in a peaceful protest, but once that right is violated by intimidation of non-striking members of the community it therefore becomes a crime,” said Nkosi-Malobane. Nkosi-Malobane said most workers were stranded and unable to travel to their respective areas of work due to the protest action. Pupils were also on the receiving end as they were denied an opportunity to go to schools during this crucial time of the year when exams are drawing closer. “The strike has a negative impact on our economy since Gauteng is the economic hub of our country. Our law enforcement agencies will not hesitate to act harshly against any form of lawlessness in our respective communities. Community members have avenues they can explore to raise their concerns instead of resorting to illegal and violent protests,” said Nkosi-Malobane.